Ella was stabbed and left to die by DeBoer. She lay at the edge of the cornfield near death until she was found the next morning by her brother on his way into town. She was taken to her father's house where she lay dying. She managed to name DeBoer as the attacker. Marshal McGrail went to the blacksmith shop to arrest DeBoer and brought him back to Ella's deathbed where she identified him as the attacker. The local citizens became extremely upset when the news of the attack spread. 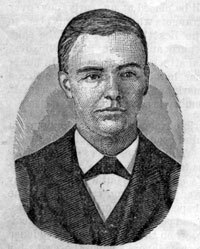 Threats of lynching were made and so DeBoer was hustled off to Metamora and put in jail away from the mob. The next morning Ella died as described in the book about the murder. Next Sunday morning at eight o'clock, the soul of Ella Martin passed away to endless rest. A weary week of suffering, surrounded by loving friends who gently ministered to her every want, cared for and watched over by her bethrothed, and then the Lord in His infinite wisdom and mercy sent forth the summons, and her spirit, pure and free, was borne away beyond the confines of earthly hopes and fears; away from earthly darkness and sin; up to the pearly gates and golden streets of the heavenly city, to dwell evermore in the palace of God. She is dead! 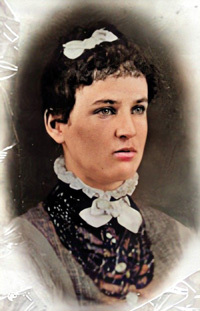 After learning of Ella's death, local men formed a vigilante group and headed to Metamora where they demanded the head of DeBoer held in the county jail. The jailer convinced the mob that they had transported DeBoer to the Peoria jail because he had tried to set fire to his jail cell. This disbursed the mob from Minonk. Oh! The Lord has taken darling Ella home to the sky. DeBoer was quickly tried and convicted of murder. 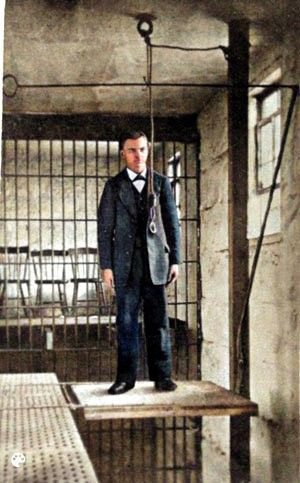 He was sentenced to be hanged on March 10, 1880 in Livingston County. Here is a description of his hanging from the book about the murder. In the presence of fifty people DeBoer stood on the little platform with the rope around his neck; and while solemn silence sat like a pall upon them, the signal was given, the spring was touched, his soul passed out into the great beyond, and JUSTICE was satisfied. The execution was conducted in a very orderly manner and reflects great credit on Sheriff Hunter who had charge of the whole affair. Thus ends DeBoer! 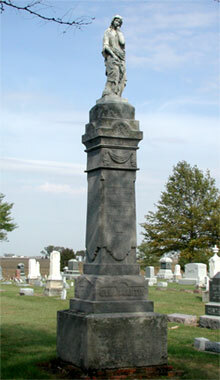 After Ella Martin was buried in the Minonk Cemetery, a number of local citizens formed a committee to purchase a large monument for her grave. Shares were sold for 50 cents apiece and $700 was raised to erect a monument. The monument is very large and ornate and still stands in the Minonk Cemetery half way between the first two drives on the west, half way back to the north. During the Christmas vacation of 1903, Mrs. Bela Stoddard who, with her daughter Zadel and son Donald, went to Chicago for a medical appointment for her son. After the medical appointment the children went to the Iroquois Theater to see the play "Mr. Bluebeard, Jr." while Mrs. Stoddard stayed at the Annex. Unfortunately, during the play a fire started on the stage. The asbestos curtain got stuck half way down and the fire leaped out into the audience causing a panic to the exit. The exits became jammed with people who eventually became crushed to death or suffocated from either the smoke or from being buried under the bodies stacking up by the exits. Almost 600 people died in the fire, one of the worst fire disasters ever.v When Mrs. Stoddard learned of the tragedy she telephoned her husband, who with Mr. Fred Simater, left for Chicago by special train from Mendota. After a search of the city's morgues the Stoddard children were found in separate morgues. Mr. and Mrs. Stoddard left for home while Mr. Simater remained to arrange the shipping of the bodies back to Minonk. A large group of people was reverently waiting at the depot when the bodies arrived in Minonk. The whole community felt the shock and sorrow of two innocent lives lost at such a young age.